In celebration of the 30th anniversary of BioTechniques: The International Journal of Life Science Methods, the journal’s publisher is pleased to announce the continued availability of monthly digital editions available for reading online and for downloading to an iPad or iPhone. View BioTechniques digital editions online now: http://www.BioTechniques.com/Digital. To be alerted when new issues are available online, or to receive the print edition of BioTechniques, subscribe today at: http://www.biotechniques.com/Subscribe. 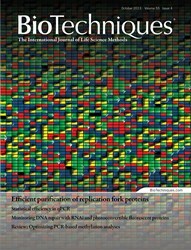 BioTechniques, the international journal of life science methods, provides open access to first-quality, peer-reviewed papers on laboratory techniques and protocols. Now in its 55th volume, BioTechniques has over 80,000 print subscribers worldwide. The journal augments its peer-reviewed content with feature articles and topic-specific supplements. Visit http://www.biotechniques.com for more details or to subscribe.